Short Term 12 tells the story of a handful of young, dedicated people who supervise a foster-care facility for very troubled youths. At the center is Grace (Brie Larson), a strict but compassionate floor supervisor who works alongside her boyfriend, the goofy but reliable Mason (John Gallagher Jr.), and an innocent new guy, Nate (Rami Malek). Through a series of quick and amusing vignettes, we meet the staff of Short Term 12 before we are introduced to the kids who define them. And what an introduction the kids have. Some are violent, others are angry. Some scream and shout and run, others sit quietly, waiting to explode. Grace and Mason are trained to handle anything these kids throw their way, but we, the audience, are not. Writer/director Destin Cretton knows this, and instead of exploiting our naiveté, he guides us steadily – never shocking, but consistently leveling us with brutal truth. This is the type of film that has a lot to say about a lot of things, and much of its brilliance is the way it doesn’t outright say them. 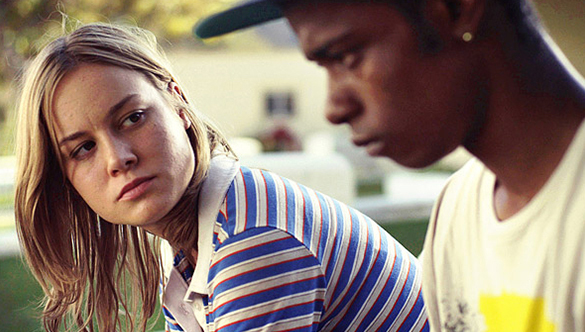 For example, most every character in Short Term 12 has endured a troubled past, yet they are rarely spoken of directly. Their pasts are discovered through conversational dialogue, sustained glances of emotional expression, tears as a way of answering a question that words would deem too horrible. Another concept Short Term 12 handles with care is the notion of repression. It’s quite common for people who have suffered acts of violence, especially at a young age, to repress the abuse they endured. And sometimes, a simple reminder is all it takes to trigger the pain. That’s what Short Term 12’s new kid, Jayden (Kaitlyn Dever), is to Grace. A reminder. When Grace meets Jayden, she immediately sees herself 10 years earlier. The neglect, the pain, the torment. Jayden and Grace’s tumultuous relationship is a highlight of a film, brutal in its authenticity. Indie darling Brie Larson is killing it this year. She’s perfectly desperate as Miles Teller’s floozy ex girlfriend in The Spectacular Now, and is silently hilarious as Joseph Gordon-Levitt’s sister in Don Jon. However, nothing can top her emotionally gut wrenching work in Short Term 12. Indie Sprit Award attention is certain, but an Oscar nomination would be well deserved. I’m familiar with John Gallagher Jr. only as Jim Harper on The Newsroom. I enjoy his work on that show, but feel that the writing often sells his character short. Mason is a welcome change of pace, as Gallagher proves he can take as many authentically emotional punches as he can throw. Likewise Dever and the rest of the talented young cast who fill the rooms of Short Term 12. Never once do you feel like you’re watching actors. This is as real as it gets. There’s a scene midway through the film that defines words like “breathtaking.” It’s the kind of scene that makes an entire film worthy of your time. A scene that, while brief, has a slow build up that peaks to emotional heights rarely tapped. It could be the most emotional consecutive 60 seconds from any film released in 2013. Brie Larson is definitely killing it as of late. I saw her in The Spectacular Now last Saturday (review will come this Sat.) and she is good in that one. I love her in Scott Pilgrim vs. the World while she is funny in 21 Jump Street. This is among the many films of 2013 that I want to see. Hopefully somewhere nearby as I'm going to return to film-watching on Sunday. She really is great. An underrated gem making a go of it. Look forward to your Spec Now review. I loved that one. So glad that Brie Larson gets a chance to shine in this. I just saw The Spectacular Now (LOVED it), and she was great in that. I'm excited to see her in a proper leading role, though. Yeah man, a proper leading role indeed. She carries this film so well, made me have a newfound respect for her. Glad you like Spec Now as well! It's funny I actually just made a facebook status about how Larson is one of those people who always slips my mind but I enjoy seeing her in anything she's in. Really need to check this one out thanks! My pleasure! I was a fan of hers before this, but now I'm a massive fan. She is sensational here. I'm glad Brie Larson is getting roles outside of high schoolers. Considering I work in a facility very similar to this one, I really look forward to seeing it. Oh wow, I had no idea that was the kind of work you're in. I would love to hear your perspective on this film. Can't wait to read your review. I definitely need to check this one out. Great review! Thanks! It's a good one. It wasn't perfect in my eyes, but it sure as hell was a great movie. One filled with real and raw emotions that you rarely so ever see in mainstream dramas of the same kind. Sadly, I don't feel like many people are going to see it, even though they definitely should. Nice review bud. Thanks man. I agree with you on both fronts: great, not perfect, and, sadly, I don't think it will draw a wide audience. Hopefully, we're wrong. Documentary-style authenticity gives this understated drama a real kick as it explores the fallout of child abuse from an angle we'd never expect.